"I went to see Spider-Man Homecoming and realised I missed the big screen experience at home. Movies were just not the same on a small 65” TV. I knew I needed the latest 4K projector." "When researching which to buy, it was an easy choice to go with Optoma as I have had three Optoma projectors already." "I like DLP projectors because you know you are going to get a razor sharp image. They handle fast movements and are easy to set up with zero maintenance. With LCD projectors you get dust blobs on the lens and convergence issues as they use multiple LCD panels." "I just set the focus, lined up the screen and watched the Fifth Element in 4K UHD. And it looked stunning! There is a famous close up shot of Leeloo’s face. I took a photograph of this shot from two foot away from the screen to show how sharp and detailed the image is. It is so impressive. Even when up close to the screen you cannot see any individual pixels with this 4K projector. There is a huge difference in image quality between 1080p Full HD and 4K UHD. You really need a big screen to appreciate this." "It’s fantastic to have the big screen back! I re-watched Beauty and the Beast with the family. On the 65” TV it is just not engaging but on the projector it completely changes the experience. The new Ghostbusters in 4K is also stunning – really cool with the colours and the out of the screen action." 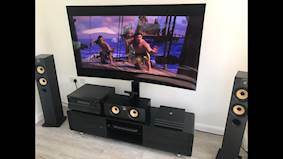 Completed set up with Grandview Cyber electric screen 106"
Challenge: Simon Todd from Littlehampton installed a large 4K TV in his new home but missed the big screen experience he got from his old 1080p projectors. 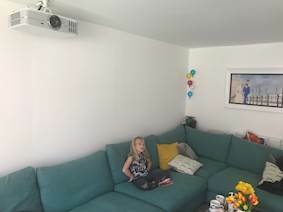 He needed the latest 4K projector that would have a high brightness to counteract the white walls and would blend in and look nice in his bright family room. Solution: He installed the UHD550X UHD 4K DLP projector with a 106” Grandview cyber electric screen. 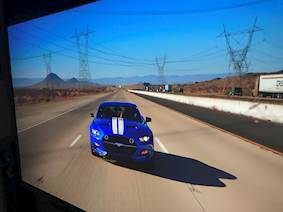 One of the most compact 4K projectors available, the UHD550X uses Texas Instruments’ XPR™ technology to deliver 8.3M pixels from a 4M pixel chip for true ultra-high definition imagery. 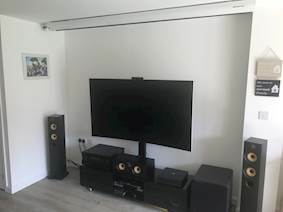 Simon Todd from Littlehampton moved into a new house in December and installed a large 4K TV. Even with the increased resolution of the 65” TV, Simon missed the cinema experience he got from his old projectors. A big fan of projectors, Simon was one of the first in the country to buy an Optoma HD67 and HD33. Even when he is away camping he is not without his movies – thanks to his Optoma ML750 ultra portable LED projector, Bluetooth speakers and power pack. Set in his family room with bright white walls, it was important to have a high brightness level to counteract the white walls. It was also imperative all equipment fit in and looked nice in his new home. Simon said: “When researching which to buy, it was an easy choice to go with Optoma as I have had three Optoma projectors already. He chose the UHD550X UHD 4K DLP projector. Packed with the latest technology and features, the UHD550X boasts High Dynamic Range (HDR) compatibility and HDCP 2.2 support. Unlike others which use just 1080p pixel chips, the UHD550X uses Texas Instruments’ XPR™ technology to deliver 8M pixels from a 4M pixel chip. 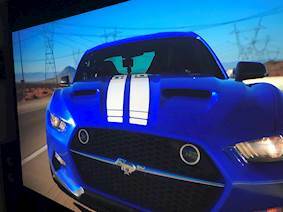 The inherent fast switching speed of the DLP chip and advanced image processing allows the projector to display the full 8.3M pixels to the screen. This guarantees razor sharp, vivid images capable of showing more details than standard Full HD – to give that cinema experience in the home. 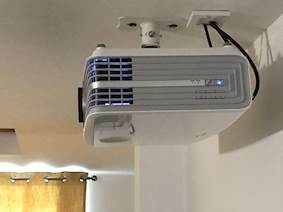 He installed high speed HDMI cables (2x15 metres) with Redmere technology to ensure the projector received a good signal despite the long cable run. Simon added: “I ordered the HD33 before any reviews were out to get one of the first units in the UK. I did the same with the UHD550X and I'm not disappointed." It took a day to install cables and screen. The projector, with Optoma's universal bracket, took under one hour to set up. 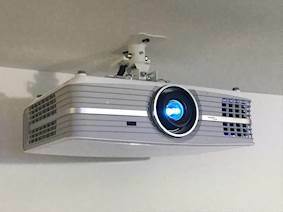 With its white chassis and being significantly more compact than almost all other 4K projectors on the market, it blends well into any living room. 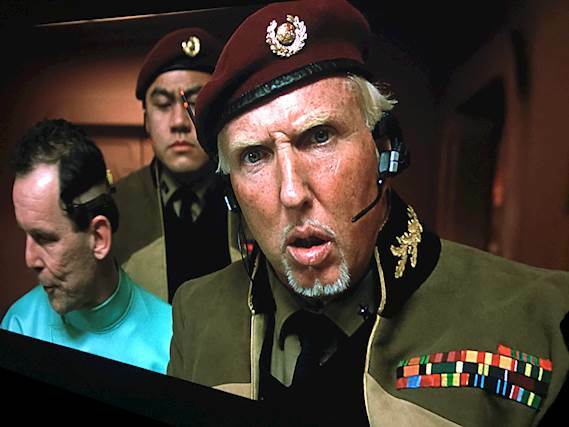 Simon said: “I just set the focus, lined up the screen and watched the Fifth Element in 4K UHD. 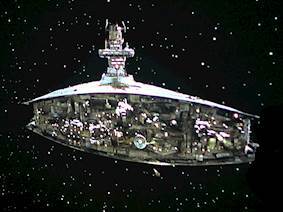 And it looked stunning! There is a famous close up shot of Leeloo’s face. I took a photograph of this shot from two foot away from the screen to show how sharp and detailed the image is. It is so impressive. Even when up close to the screen you cannot see any individual pixels with this 4K projector. There is a huge difference in image quality between 1080p Full HD and 4K UHD. You really need a big screen to appreciate this. “It's fantastic to have the big screen back! I re-watched Beauty and the Beast with the family. On the 65” TV it is just not engaging but on the projector it completely changes the experience. The new Ghostbusters in 4K is also stunning – really cool with the colours and the out of the screen action." 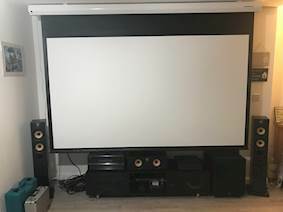 Optoma UHD550X 4K DLP projector, Grandview Cyber electric screen 106", Onkyo TX-NR808 receiver, Samsung 8500 UHD player, PS4 Pro 4K, Dune Solo 4K media player, QNAP 12TB NAS for film storage, Samsung 65” KS9000 TV for everyday viewing, Bowers and Wilkins 684 s2 tower speakers, Bowers and Wilkins HTM62 centre speaker, Bowers and Wilkins M-1 speaker, SVS pb1000 subwoofer, Onkyo 676 amplifier, Atmos and Sky Q 4K.